On Sunday 4th November, pfizer Cooma will be alive with the sounds of over 100 musicians vying for the title of Australian National Busker Champion as well as over $2000 in prize money. The Australian National Busking Championships ™ is an inaugural event for Cooma and will coincide with the annual Snowy Ride which brings over 4000 visiting bike riders to the region. The Australian National Busking Championships ™ will be quite unique event as it is a celebration of music in all its rich and wonderful variety. All sorts of different styles of music will be performed at this event including, Folk, Rock, Country, Bluegrass, Jazz, Blues and Classical. As well as many of our own local talented musicians such as, Vendulka & Vasek Wichta, the Numeralla Fingerplunkers Bluegrass Band, Stypa, Cooma Harmony Chorus, Manny Aigner, Brodie Buttons, Mike Waddell, Matthew Ventura, there will be more musicians are coming from all over, including, Melbourne, Sydney, Canberra, Albury, Bega, Bombala, Jindabyne, Cadello and Cobargo. This event is presented by Cooma School of Music with the active support of the Cooma-Monaro Shire Council through the Cooma Visitors Centre. We are very excited about this new music event. In the future, we can see this unique concept growing into a major festival of national prominence for Cooma. 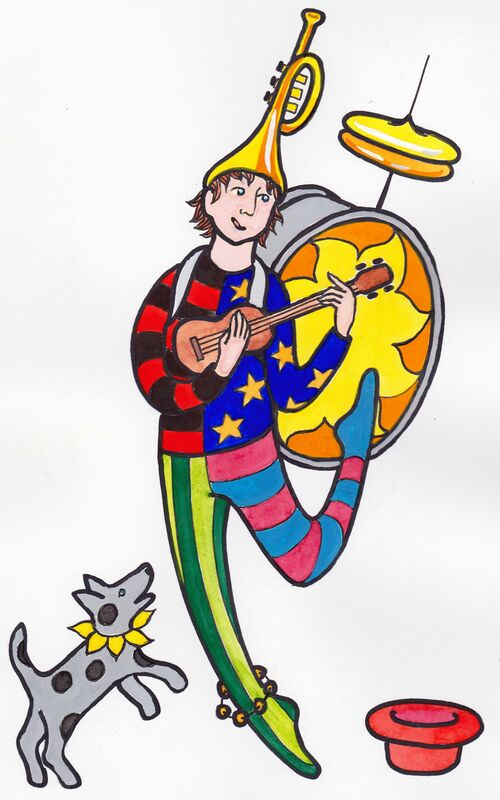 We are also delighted with the very positive response from our local businesses to our request for them to ‘Host A Buskers Spot’. During this event the buskers will be performing all around the CBD of Cooma. Venues include, Cooma Monaro Railway, Cooma Café, 40 Café, Target Country Cooma, Woolworths Cooma, Cooma Visitors Centre, Alpine Hotel, Cooma Hotel, The Lott Foodstore, Kettle & Seed Café, Roses Restaurant, Snowy Camping World, Cooma Colour Print, Judonna’s Icecreamery & Café, Leo Percys Newsagency, P D Murphy, Naaz Indian Restaurant, Cooma Mitre 10, Pages of Life Bookstore, Pizza House, Pha’s Thai Kitchen, Moontree Health Food and Centennial Park. The People’s Choice Prize will also be awarded. This will be an chance for the public to decide which busker they liked the best. Specially printed “Busker Dollars” will be availabe free from the Cooma Visitors Centre. People can then cast their vote by placing their “Busker Dollars” into the hat of their favourite busker. At end of the day the busker will the most “Busker Dollars” wins the People’s Choice Award. A free ticket to a lucky draw will also be given to each person who picks up their “Busker Dollars” from the Cooma Visitors Centre. The prize for the Lucky Draw will be a Greg Bennett acoustic guitar valued at $429. 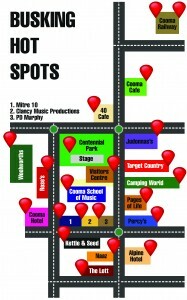 The Australian National Busking Championships will be a great day of music, fun and excitement. It’s great family entertainment and it’s all free. 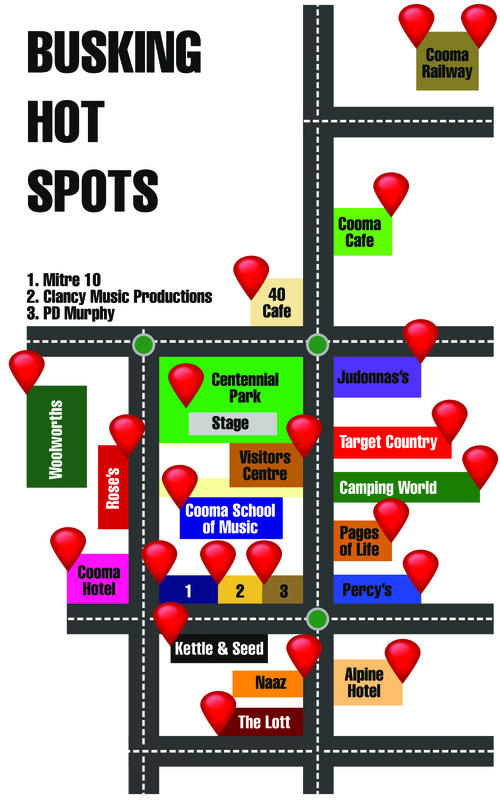 So come and enjoy all the music on show in Cooma on Sunday 4th November. You might even win a beautiful guitar! This entry was posted in Competitions, Concerts & Events on October 25, 2012 by allan.